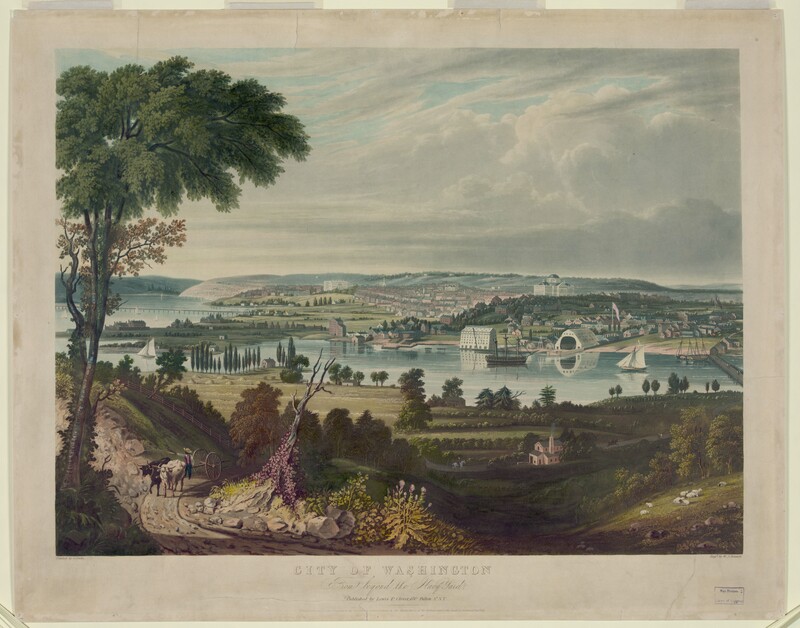 It was purported that experienced horticulturalists saw the hills of Washington, DC, as favorable to the cultivation of a vineyard and the production of “native wine”. This was still regarded as theory when Dr. John B. Keasbey (1833-1886) began experimenting at his Azadia Vineyard. Dr. John B. Keasbey was a surgeon in the Union Army, surgeon of the Metropolitan Police and a professor of “obstetrics and diseases of women and children” at the Columbian College in Washington, DC. His interests extended beyond medicine for he cultivated a 10 acre vineyard from which he made wine. His property was located in a hilly area on Rock Creek Road north of Pierce’s Mill on the way to Tenleytown. As I have written before in “Cultivated with so much success”: The Vines and Vineyards of Washington, D.C. 1799-1833 there were both nurseries and vineyards in this area since the turn of the century. While the cultivation of vines in Washington was in no way theoretical by the 1860s, there are but few accounts of the production of a significant quantity of wine since John Adlum. The majority of the Azadia Vineyard was set out in 1863. The vines were planted with a southern exposure on diverse soils that were mainly sandy, gravelly soils of decomposed granite. In 1865 Dr. Keasbey was able to sell $500 worth of grapes and in 1866 he not only sold grapes but also made 1,300 gallons of wine. By 1868 he sent bottles of “’American Burgundy’ (dark)” to New York where, when tasted blind, were thought to be “a fine sample of French Burgundy.” Other samples that were tried by local “connoisseurs” caused surprise for their “fine quality.” He produced at least two types of wine, the Burgundy made from the Concord variety and a “heavy red wine” made from Norton’s Virginia. Unfortunately, I cannot find any reports of the “American Burgundy” in New York newspapers. Azadia Vineyard produced both grapes for the table and for wine making. It was regarded as an experiment so “almost every known variety of grape” could be found “including the hybrids.” Both of these products had potential for profit because table grapes had a market in New York and the wines could be a “formidable competitor” to those of the west. The “early grapes” ripened around August 15 which was one week earlier than in New York and one month earlier than in the west. This meant the grapes could briefly command the highest prices before massive amounts arrived from the west. 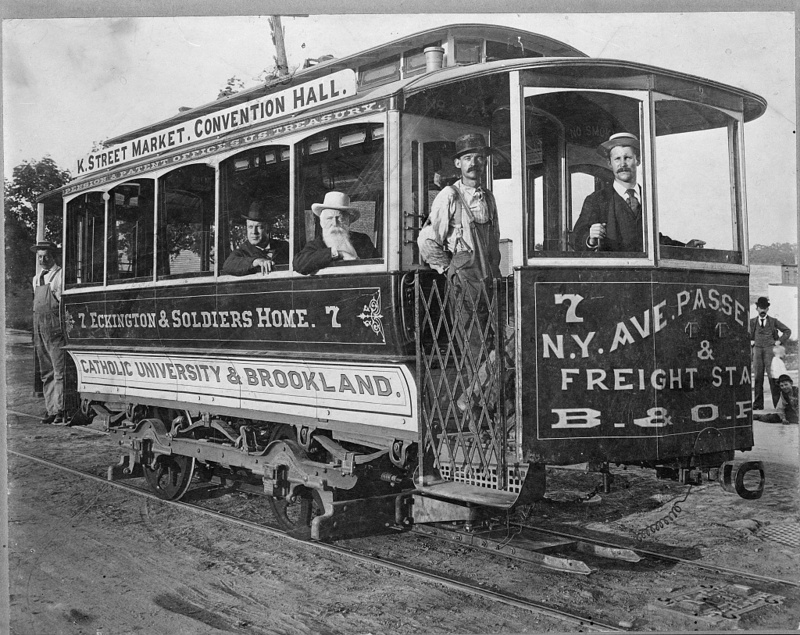 The Concord grapes were shipped by steamer in 20 pound boxes and the Delaware grapes were sent by express in one to two pound boxes. The Concord proved most profitable earning $0.14 to $0.25 per pound. Mildew was a significant problem and the aversion of it was one focus of Dr. Keasbey’s experiments. It was believed that mildew could be averted by preventing “too rapid radiation under the sun” or simply keeping the dew off of the vines. With that goal in mind, Dr. Keasbey tried at least three different methods. He employed trellises holding hardier vines trained to have foliage over the weaker vines. This showed some success. Dr. Keasbey also used a method invented by Mr. Sanders, Superintendent of the Propagation Garden near the U.S. Capitol. This involved attaching a shed roof on top of the trellises. The protected vines showed more success than the foliage method. The greatest success came from the smallest trial in a field of vines. A single sash of unpainted glass was suspended over two or three vines. Like an open-air hot-house this is similar to a method that was often employed in England. Dr. John B. Keasbey was not just tending his own vineyard and producing wine, he was selling grapevines as well. Several advertisements appear during the years 1866 through 1869. He advertised stock for Adirondac, Delware, Concord, Iona, Rogers Hybrids 1,2,4,5,7,9,15,22,30,33, and Salem. One advertisement alone listed 30,000 Concord grapevines 1 and 2 years of age. Sold in groups of 1,000 it appears that Dr. Keasbey planned to operate in the three areas of propagation, table grapes, and wine. Despite the early success of the Azadia Vineyard accounts fall silent after 1869 with no apparent explanation. During the summer of 1871, Dr. Keasbey advertised his country residence “Dunbarton Hall” for sale. This is not to be confused with Dumbarton Oaks. The Dunbarton property contained about 23 acres of land of which 7 acres were bearing grapes. I wonder if the acreage of the vineyard reduced from 10 to 7 acres due to attrition from experimentation. We do not yet know why his property with the Azadia Vineyard was put up for sale. Perhaps work took him elsewhere or that the death of his daughter just a few months after birth prompted him to leave. Whatever the reason, the listings continued to point out the “Seven Acres In Splendid Grapes” through 1875. Whether the vineyard survived after this date is not known. The death of Dr. Keasbey in 1883 and the purchase of Dunbarton Hall in 1887 by William K. Ryan certainly gives closure. Early residents of Washington, D.C. could purchase plants and trees from both local and distant nurseries. For example, those who gave money to Mr. Leflet in 1799 to purchase fruit trees from his proposed nursery near Georgetown, could pick them up from the house of Francis Motter. As early as February 10, 1802, Theo. Holt advertised as a seedsman and nurseryman with a “Nursery Garden” located near the Eastern Branch. On January 28, 1803, he listed fruit trees, flower shrubs, rakes, imported roots, and other items for sale. The Strawberry Hill Nursery near New York advertised locally in the Washington Federalist on March 11, 1803, as “containing the most extensive collection of European and American Fruits &c.” Incredibly, they would deliver forest and flower shrubs without expense. Both local and distant nurseries are of interest because they were a potential source of grapevines for the early gardens, vineries, and vineyards of Washington, D.C. They also demonstrate the market for grapevines and the varieties which were in favor. This post is concerned with the period just prior to when Congress held its first session in Washington, D.C. to formation of the Columbian Horticultural Society. George Town and Federal City, or City of Washington. Atkins & NIghtingale. 1801. No. 2002695146. Library of Congress Prints and Photographs Division. John A. Saul described 19th century nurseries of Washington, D.C. in his April 9, 1906, address on Tree Culture, or a Sketch of Nurseries in the District of Columbia. He found only three nurseries “of any considerable extent” and several others with more limited business. He considered the major nurserymen to be John Adlum, Joshua Peirce, and his own relative John Saul. He made note of other nursery references he came across including Adam Linday’s advertisement for grape cuttings on March 20, 1830. John Saul’s nursery was in business at a later date so he is not featured in this post. Thomas Pinney focused in on John Adlum in his A History of Wine in America, From the Beginnings to Prohibition so I shall place John Adlum in context but not in much depth. 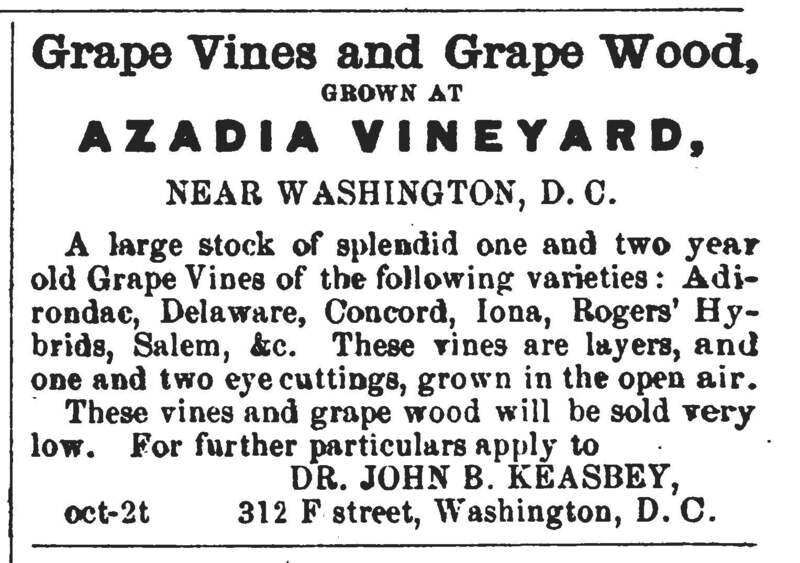 What follows is a chronology of the newspaper advertisements in Washington, D.C. for the sale of grapevines followed by a chronology of vineyards. In 1816 Mr. Smith published A Chorographical and Statistical Description of the District of Columbia. Mr. Smith describes the nursery of Mr. Main as located two miles from Georgetown “on a hill of steep ascent, elevated about a hundred feet above the level of the river.” Mr. Main was a 60 year old Bachelor from Scotland who learned about gardening on the “banks of the Tweed.” He rented a 60 acre plot of land for 20 years at 200 Guineas. At the time of publication “[t]welve of these years have already elapsed.” He had selected the east side of the hill for the cultivation of the black Hamburg and “white chassela” vines. His cultivation succeeded for three years but on the fourth year there was an unusually warm November followed by a frost. This “split the vinestalk one foot upwards from the surface of the ground, and thus destroyed all the hopes of the proprietor.” Mr. Smith comments Mr. Main did not have enough money to procure additional vines, “except on a small scale, and merely for the purpose of furnishing plants for sale, for which he found there was little demand.” He then turned his attention to “the indigenous thorn” of which “he sells a great number annually.” Mr. Smith states that 50,000 year-old thorns were sold to a Virginia planter. Thomas Main advertised his nursery near the Little Falls of the Potomac River as specializing in thorns for hedges on December 30, 1803. 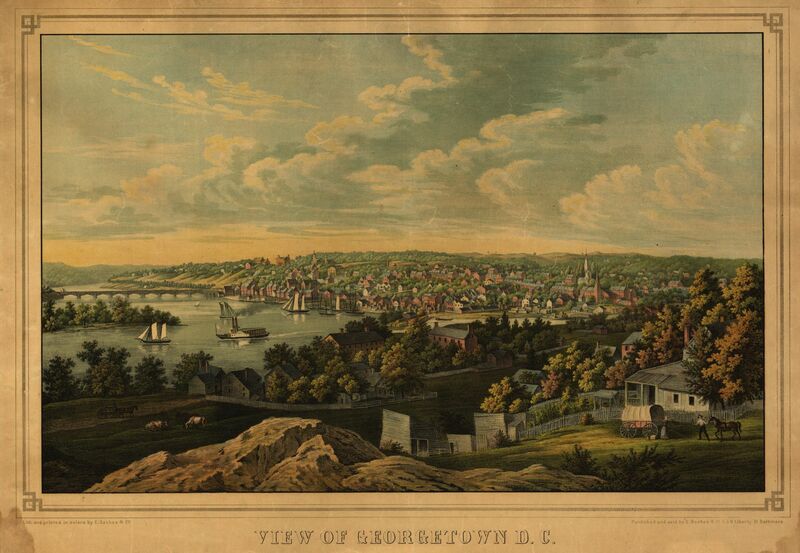 On September 29, 1810 he described his nursery as near Georgetown and appeared to continue a specialization in thorns. By February 24, 1814, Thomas Main had passed away but the executor of his estate, William Bunyie, advertised the sale of seeds and vegetables at his store. At the nursery there were “thousand plants of the Pyracantha”, hedge thorns, and a variety of fruit trees amongst other plants. Between Mr. Smith’s Chorographical and Thomas Main’s advertisements, we may date his vineyard. According to Mr. Smith’s book published in 1816, the vineyard was located on a hill where there was a nursery of trees. Twelve years had elapsed since Thomas Main rented the property for his nursery thus suggesting the first year of rental was 1804, at the latest. However, in December 1803, Thomas Main was only advertising 40,000 “American white Thorns”, which he did not switch to until after the destruction of his vineyard. Given that the vineyard was destroyed in a November, it would be unlikely that Thomas Main would be able to sell such a quantity of thorns one month later. Thus the advertisement suggests he first cultivated vines in 1799 through 1802 when they were destroyed. Thomas Main was certainly in the Georgetown area for he had a letter at the Post Office on April 1, 1800. While I have yet to uncover direct evidence of the chronology for his vineyard but the circumstantial evidence is suggestive. I have searched for weather reports but have not yet found any for those specific years. There were local nurseries within Washington, D.C. such as that of James Thompson at Maryland Avenue between the Capitol and Potomac Bridge. Unfortunately this was seized on March 11, 1824 due to four writs of fieri facias. More successful were the nurseries of Joshua Peirce, John Adlum, and Adam Lindsay. Together the provided a source of grapevines between 1821 and 1831. The next local nursery to advertise the sale of grapevines is that of Joshua Peirce. He advertised on December 28, 1821 that he had taken over the nursery run by his father. He had “a great variety of choice and well selected fruit trees”, ornamental trees, shrubs, fruit, and grapevines. He was also willing to exchange for cuttings, seeds, and roots of anything not in his collection. Items could be purchased at David Shoemaker, Jr. near the General Post office or at J. Fay’s seed store on Pennsylvania Avenue. Joshua’s father, Isaac Peirce appears to have been located in Georgetown as early as April 8, 1802, for he had a letter at the Post Office. On December 14, 1814 he advertised the sale of 100 different types of apple trees composed of 20,000 individual trees at his nursery on Rock Creek three miles from Georgetown. Isaac Peirce never advertised the sale of grape vines so it is possible they were of minor interest. Joshua Peirce received the land by deed from his father on October 10, 1823. According to John Saul the property was located “at the mouth of Piney Branch, and running north. It contained eighty-two acres, two roods, and twenty-eight perches.” The house was located at Klingle Road and Beach Driveway. There was a second property of 54 acres was centered on R and S Streets and 14th and 15th Streets. This property acted as an extension of the prime Linnaean Hills nursery. Linnean Hill, Historic American Building Survey, Albert S. Burns. 1934-1935. No. 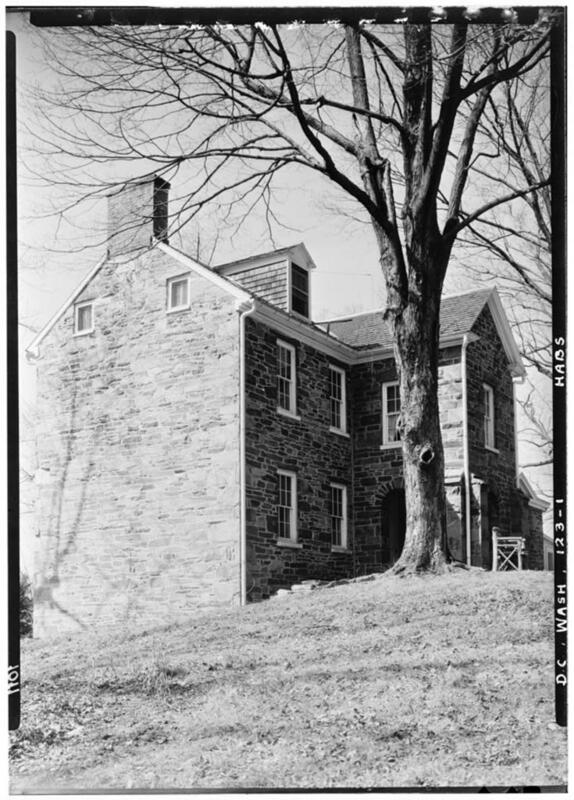 HABS DC,WASH,123–1.Library of Congress Prints and Photographs Division. On February 18, 1824 Joshua Peirce advertised his nursery as “on Rock Creek, near Washington” with the signature “JOSHUA PEIRCE, Linnaean Hill.” Applications were now taken by Thomas Levering near the General Post Office and Edward M. Linthicum at Bridge and High Street in Georgetown. His advertisement of December 28, 1828 lists that he has “on hand about 1000 vines of the native Grapes, such as are cultivated with so much success in the neighbouring vineyard for wine” By February 27, 1832 his collection grew to 12-15,000 grape cuttings of Catawba, Isabella, Bland, and Constantia, native varieties. These had been “cultivated with so much success in the neighboring vineyards.” Apparently at least one more vineyard was being cultivated since his previous advertisement. One year later on February 27, 1733 Joshua Peirce grapevine inventory was smaller for he only advertised “A few thousand cuttings of the Catawba, Isabella, and Constantine grapes”. The Bland and native varieties disappeared from his list. Home of John Adlum, Facing Southwest. Saul, John. Records of Columbia Historical Society, Vol 10. Google. Thomas Pinney supports the view that John Adlum was the “Father of American Viticulture.” John Adlum purchased three properties consisting of 45 acres from John Heugh on December 4, 1816, one acre and 36 perches from Joseph Nourse on June 11, 1819, and two tracts of 93 acres and one quarter acre from James Dunlop on February 4, 1820. 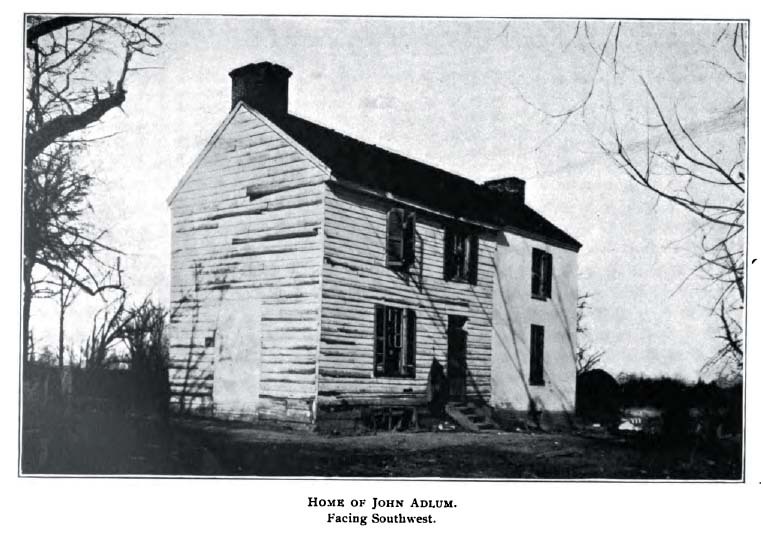 John Saul locates Adlum’s house at the southeast corner of his property which is now Connecticut Avenue and Peirce Mill Road. The Peirce Mill Road being named after the road which went between Isaac Peirce’s mill and Georgetown. John Adlum first describes his vineyard on November 8, 1822 in a letter dated September 17, 1822. He describes his 0.4 acre “small Vineyard” planted with cuttings in 1820. He had a total of one acre of bearing vines with four more acres that should come into production in 1823. His plans included planting five more acres during the Spring of 1823 for a total vineyard size of 10 acres. For the spring of 1823 he intended to offer “several thousand cuttings of vines for sale, of various kinds, foreign and domestic.” Indeed a little over one year after Joshua Peirce first advertised the sale of grape vines John Adlum advertised several thousand cuttings for sale at his Vineyard on February 22, 1823. Of the varieties offered, he implies he made wine from the Tokay, Constantia, Bland Madeira, Schuylkill, Muscadell, and Munier or Miller Burgundy. Of those he had not made wine include the Worthington, Columbia, Red juice, Elkton grape, very large, Carolina Muscadine, Real Madeira, Frontinac, Sweet Water, and Royal Muscadine. John Adlum continued to advertise his grape cuttings and wine, later known as “white or red Adlumnian” wine until July 18, 1832. Vine Hill is first advertised for rent by Thomas W. Pairo on April 7, 1828. It contained a vineyard of one thousand grapevines comprised of 25-30 different types of European table and wine grapes. Three hundred of the vines were in the bearing state. By March 18, 1830, the Vine Hill vineyard had grown to 5-6,000 grape vines. That is a significant increase in only two years for a property up for rent. On March 3, 1831, Thomas W. Pairo advertised his own 3,000 young grapevines with roots one to three years of age. These were a mixture of foreign and domestic vines. This advertisement clears up the earlier confusion I pointed out in my post “Near the President’s House”: The Advertisements of William Cox, Wine Merchant, Washington, DC 1826-1827. In that post I suspected that Thomas W. Pairo’s vineyard was actually Vine Hill and now I believe they were separate. 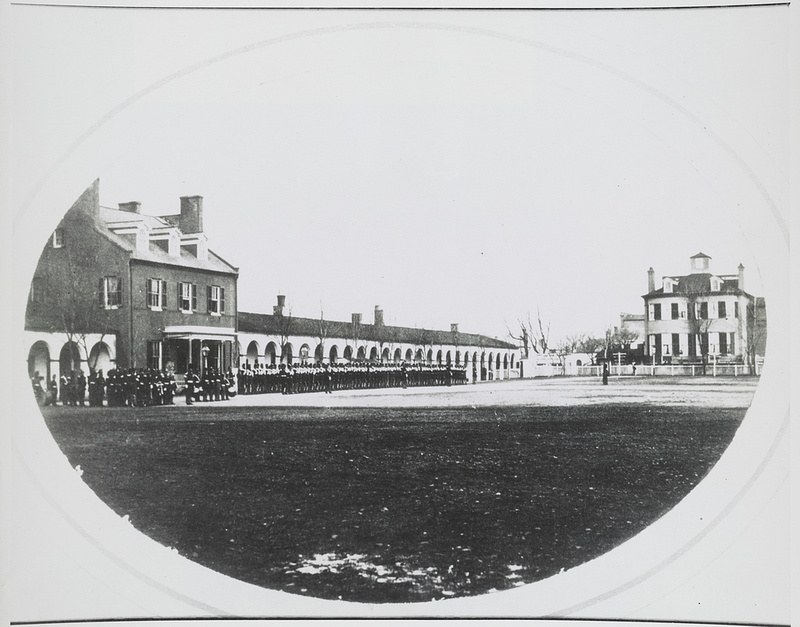 Commandant’s house at the U.S. Marine Corps Barracks, Washington, D.C. 1859-1864. NO. U.S. GEOG FILE – Washington, D.C.–United States Government Buildings–Marine Barracks. Library of Congress Prints and Photographs Division. Adam Lindsay first advertised the “A LARGE quantity of Cuttings of the finest Grapes” which were for sale at his vineyard near the Navy Hospital three-quarters of a mile East of the Capitol. These advertisements ran until March 30, 1830. The following year on March 3, 1831 Adam Lindsay advertises his “Cottage Vineyard” as having for sale “Cuttings of the best varieties of Grape, procured from France, Spain, Italy, and the shores of the Mediterranean” as well as native grapes. A few years later Adam Lindsay places an advertisement stating his vineyard “is between Pennsylvania Avenue and East Capitol street, not far from the Marine Hospital.” This location is verified by an early advertisement on July 21, 1809, when he placed his dwelling house and store located on East Capitol Street up for rent. 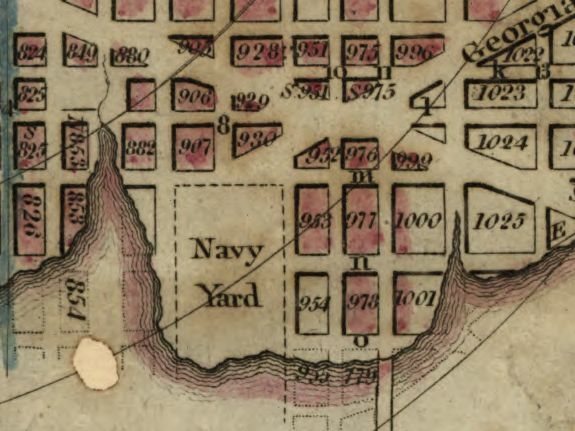 Adam Linday’s description of the Navy Hospital and Marine Hospital imply that he had, at some point, vineyards at two different locations. The hospital at the Navy Yard was created sometime prior to 1802 and the hospital at the Marine Barracks was created prior to 1835. The local sale of grapevines suggests a demand by local vineyards. In my post Bomford, Lindsay, and Smith: The Early Vineyards of Washington ,D.C. I detail three different vineyards. Colonel Bomford first planted his vineyard between 1816 and 1824 and it was still in existence on March 18, 1830 when it was known as Vine Hill. Adam Linday’s first vineyard was initially mentioned in 1830 so it might have been planted around 1827. Samuel Harrison Smith had a vineyard at his Sidney estate which would have been planted around 1826 and still in existence in 1830. There were other earlier vineyards as well. On April 23, 1810, Thomas W. Pairo advertised the country seat of the late Mr. Thomas Hewitt which contained about 200 European Grape Vines within the five acre lot. The seat was located on a “Handsome HILL east of Mr. Barlow’s within a mile from the President’s House.” On September 17, 1810, another advertisement was placed refining the location as “the hill between Mr. J. Barlow’s and Mr. M. Nourse’s.” The lot was now 8 acres with a second 25 acre lot available. It contained “a small Vineyard of excellent European Grape Vines.” Mr. Nourse’s house is now the administration building for Sidwell Friends School on Wisconsin Avenue. 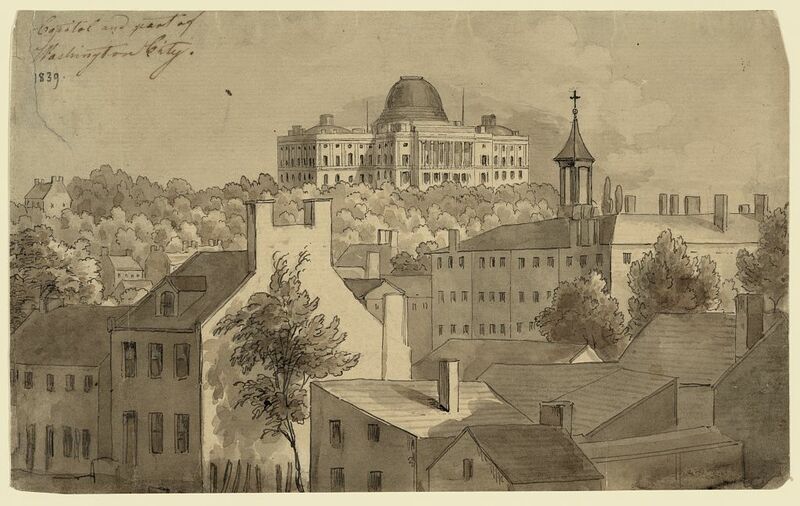 On March 24, 1829, the sale of a 50 acre farm, three miles due north of the Capitol was advertised. It contained an orchard with 300 apple and peach trees and a “flourishing Vineyard of 800 Vines.” Inquires could be made to Colonel William Doughly at the Navy Yard or James H. Doughly at the General Post Office. Give the description I suspect this was the Pleasant Hill Vineyard. On July 21, 1830, Thomas Mustin began a series of advertisements for the Pleasant Hill Vineyard. 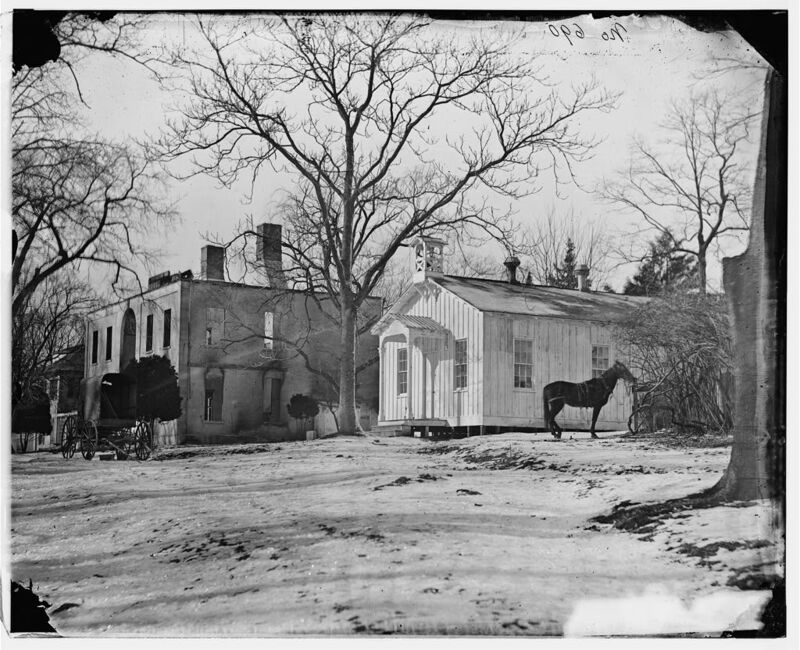 This estate was located 3.5 miles north of the Capitol in the “immediate neighborhood of Rock Creek Church.” It contained an apple and peach orchard and “a thriving young vineyard, of five or six acres, now in the bearing state.” Apparently it remained unrented for on August 30, 1831, Thomas Mustin advertised the sale of his grapes as a “fine crop of this delicious fruit”. The varietals included White Sweet water, Catawba, Isabella, Constantia, and Schuylkill Muscadell which were “now turning, and will be fully ripe in eight or ten days.” He offered a reduced price if taken directly from the vineyard. View of Georgetown D.C. E. Sachse & Co. 1855. No. PGA – Sachse (E.) & Company–View of Georgetown D.C. Library of Congress Prints and Photographs Division. The estate of Charle Varle, formerly owned by Mrs. Sarah Love, was advertised for sale on March 3, 1830. It was located 1.25 miles from the western edge of Georgetown near the turnpike leading to Fredericktown. This is presumably the present Maryland Route 355. Within the 99 acre estate was a vineyard which had “produced excellent grapes for several years.” If it had born fruit for three years, the first crop would have occurred in 1827 suggesting it was planted around 1824. At the meeting of the Columbian Horticultural Society held on August 3, 1842, Mr. Watterston gave a long address. In describing the origins of the society, the idea had “been suggested by a venerable citizen, who had devoted several years of his life to the cultivation of the native and foreign grape, with no little success, and that it had been early embraced and carried into effect by a number of public spirited men.” The Columbian Horticultural Society was organized on August 21, 1833. Amongst the names of the originating officers who cultivated the vine are society president Colonel Nathan Towson and “Councillors” Adam Lindsay, William Winston Seaton, Colonel George Bomford, and Joshua Peirce. West front of the United States Capitol with cows in the foreground. Smith, John Rubers. 1831. No. DRWG/US – Smith (J.R.), no. 34.Library of Congress Prints and Photographs Division. In 1822, the names of George Bomford and Nathan Towson appear in the Distribution of the Army as published in A National Calendar. Lieutenant Colonel George Bomford is listed under Ordnance of the First Regiment of Artillery. Colonel Nathan Towson, Maryland was under the Second Regiment of Artillery. Ten years later under the War Department appears Brevet Colonel George Bomford, Chief of Ordnance and Nathan Towson, Paymaster General. Amongst the members of the Washington National Monument Society were William Winston Seaton, Colonel George Bomford, George Watterston, and Nathan Towson. Samuel Harrison Smith was co-proprietor of the National Intelligencer, later known as Daily National Intelligencer, along with William Winston Seaton who later became Mayor of Washington in 1840. In the 1820s he was also a member of the Columbian Institute for the Promotion of Arts and Sciences. Charted by Congress in 1818 the society succeeded in the creation of the United States Botanic Garden. The members of this society included Samuel Harrison Smith, Colonel George Bomford, and Colonel Nathan Towson. George Shoemaker was the president of The Farmers and Mechanic’s Bank in 1862. Adam Lindsay not only built the reservoir near the Eastern Branch but also the Eastern Branch Bridge in 1819-1820. Joshua Peirce ran the Linnean Hill nursery on 83 acres of land in Cleveland Park. In his 1824 Catalogue of Fruit and Ornamental Trees and Plants…at Linnaean Hill there are listed 24 different grape varieties. 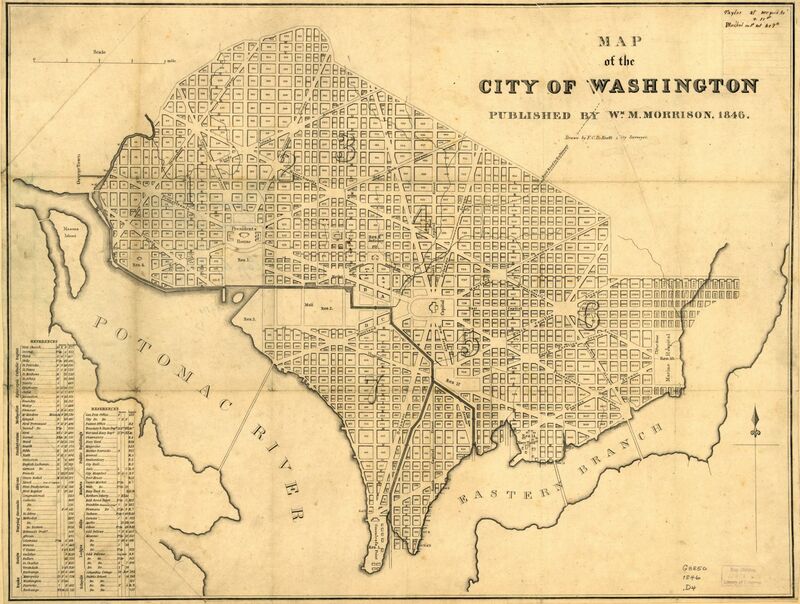 Map of the city of Washington. De Krafft, F. C. 1846. No. G3850 1846 .D4. Library of Congress Geography and Map Division. The early cultivators of the grapevine in Washington, D.C. were bound not only for their appreciation of the grapevine. They were bound by military service, membership in societies, and prominence in Washington, D.C. The reports on the Columbian Horticultural Society give a strong sense of which varietals were cultivated from the mid-1830s through the early 1840s. It is no doubt that William Winston Seaton’s participation in the society and co-proprietorship of the National Intelligencer resulted in the detailed reports which were published in his newspaper. These reports were disseminated by many horticultural journals of which I have relied on. It is from a selection of these reports that this post focuses on. I do not mean to imply that it was only prominent families who cultivated the grapevine. The members of the Columbian Horticultural Society who cultivated the grapevine also exhibited other fruits, vegetables, and plants. The numbers of vines cultivated is not specified so the extent that their gardens contained “vineries” or vineyards cannot yet be ascertained. Whether they produced wine is also unstated but some idea may be derived from the varietals exhibited. In 1826, John Adlum classified grapes as either “table grapes” or “wine grapes.” Table grapes included Malmsy, White Sweet Water, Chasselas, Munier or Miller Burgundy, and Isabella. Wine grapes included Catawba, Bland Madeira, Schuylkill Muscadel, Constantia or Cape of Good Hope, Worthington, and Lufborough. In 1857, Joshua Peirce classified his grapevines as “those that are native” and “those good for the table.” The Catawba and Isabella were classified as native, table grapes whereas the Northern Muscadine, Concord, and Diana. The Catawba and Isabella varietals appear most frequently followed by Malaga and Chasselas. Thus it appears a combination of wine and table grapevines were cultivated. The first Annual Exhibition of the Columbian Horticultural Society was held at City Hall on June 5-6, 1834. Though there was no mention of grapevines some of the exhibitors included Mrs. Bomford, Joshua Peirce, Mrs. Colonel Towson, and Mrs. Seaton. Beginning with the June 1835 meetings of the Columbian Horticultural Society no grapevines were presented until October 3, 1835. On this date Adam Lindsay exhibited Catawba, Roman plum, Mississippi, and white Chasselas grapes. Joshua Peirce exhibited Catawba grapes. At the November 7, 1835 Fall Exhibition the society noted that the “season had, indeed, been very favorable.” Though no grapes were specifically mentioned there “was also a considerable collection of fruit, chief from the orchards of Mr. Barnard and Mr. Smith.” It is unclear whether this is a reference to Samuel Harrison Smith’s orchard at Sidney. View of Washington, D.C., looking northwest from southeast of the U.S. Capitol. Kollner, Augustus. 1846-55. No. DRWG/US – Unattributed, no. 56. Library of Congress Prints and Photographs Division. 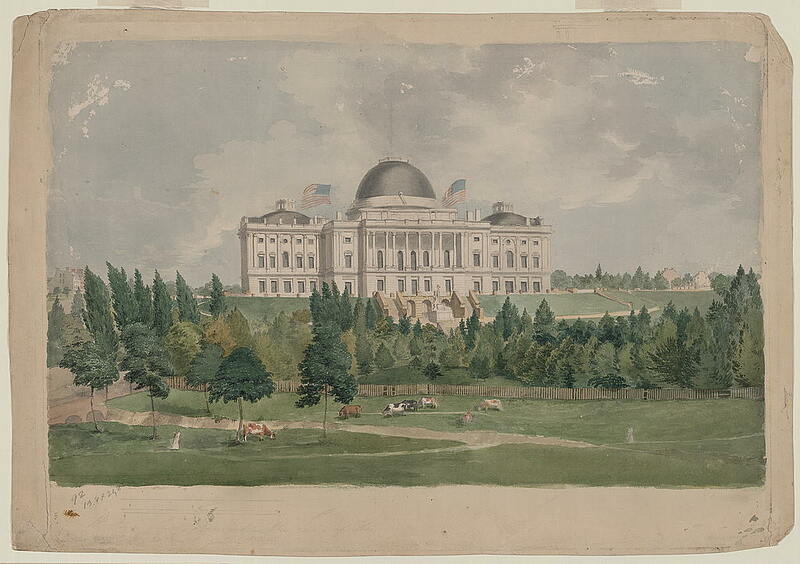 Capitol at Washington D.C.– West view. Kollner, Augustus. 1839. No. DRWG/US – Kollner, no. 14. Library of Congress Prints and Photographs Division. By 1845 the Columbian Horticultural Society had discontinued its exhibitions. A group still gathered to exhibit fruit which was displayed at the store of John F. Callan. These specimens were left between August and September, 1845. John Pearce submitted Chasselas de l’Eau which weight one pound per bunch and Mrs. Seaton submitted six ounces each of Catawba and Isabella. J. F. Caldwell submitted what appears to be his own varietal the “Caldwell’s Seedling, a very meritorious grape.” John Pearce won the first prize or “Premium” followed by J. F. Caldwell who won second. John Pearce, not to be confused with Joshua Peirce, was the gardener of Thomas Blagden. Thomas Blagden, amongst other activities, sold the land for the Government Hospital for the Insane, later known as St. Elizabeth’s. In conducting research for my previous post “Near the President’s House”: The Advertisements of William Cox, Wine Merchant, Washington, DC 1826-1827 I came across Jonathan Elliot’s Historical Sketches of 1830. In this book he describes three vineyards in Washington, DC: John Adlum’s vineyard in Georgetown, Samuel Harrison Smith’s vineyard at Sidney, and Thomas W. Pairo’s near Rock Hill. John Adlum’s Georgetown vineyard has been described to some detail in Thomas Pinney’s History of Wine in America, Volume 1. In researching the vineyards of Smith and Pairo I came across two references to Adam Lindsay’s vineyard. It turns out that this vineyard was described by John A. Saul on April 9, 1906 when he presented a paper on the history of nurseries in the District to the Columbia Historical Society. He also references David Baillie Warden’s District of Columbia book published in 1816. In this book a Mr. Maine is described as having a nursery about two miles north of Georgetown where he “grew grapes, fruit, and other trees.” Whether these were table or wine grapes is unspecified. 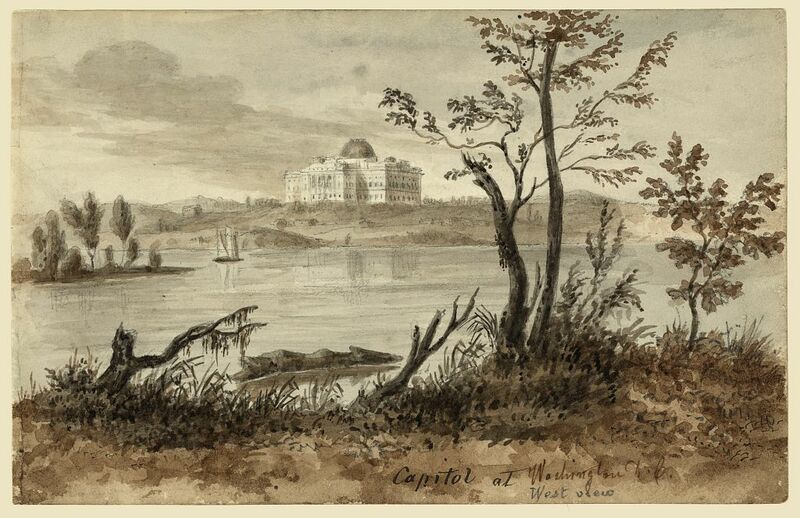 Capitol and part of Washington City. Kollner, Augustus. 1839. No. DRWG/US – Kollner, no. 9.Library of Congress Prints and Photographs Division. John Adlum advertised the sale of grape vine cuttings and slips for both table grapes and wine grapes. According to Thomas Pinney, John Adlum noted that he was out supplied by the demand for his vine cuttings in 1824. His advertisements appear in the Daily National Journal as early as March 4, 1826 and as late as May 20, 1829. Thomas Pinney notes that John Adlum faded from publicity between 1830 and his death in 1836, though he continued to cultivate vines and make wine. Topographical map of the District of Columbia. 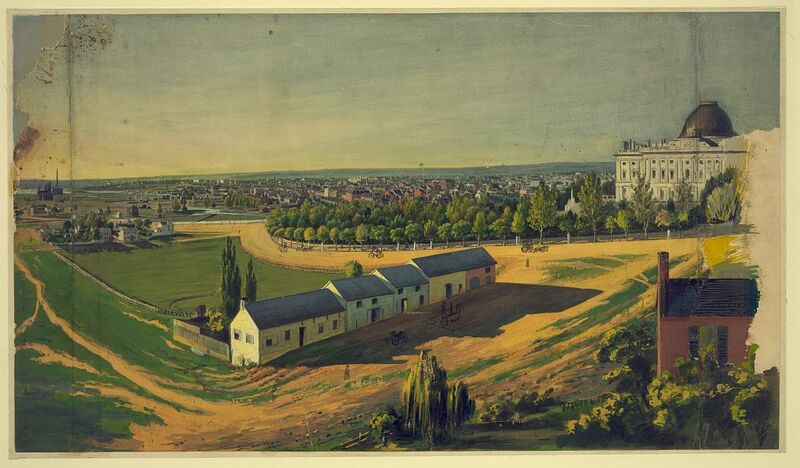 McClelland, Blanchard & Mohun, 1861. No. G3850 1861 .B6. Library of Congress Geography and Map Division. All three vineyards featured in this post were described in publications from 1830. Colonel Bomford’s vineyard could have been planted as early as 1822 and Samuel Harrison Smith’s vineyard was perhaps planted in the mid 1820s. Colonel Bomford and Samuel Harrison Smith socialized together. Samuel Harrison Smith was friends with Thomas Jefferson with whom John Adlum corresponded with. It is plausible that these men were aware of each other’s vineyards. It is also plausible that John Adlum supplied Colonel Bomford, Adam Lindsay, and Samuel Harrison Smith with vine cuttings. I do find it interesting that the history of these vineyards appears to fall silent after 1830. After publishing this post I came across reference to The First Autumnal Exhibition of the Columbian Horticultural Society held on September 21-22, 1837. 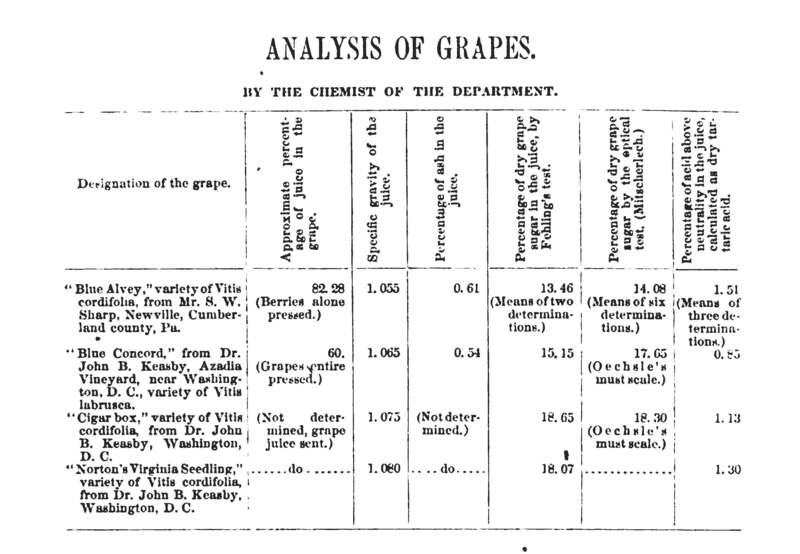 In the Report of the Committee on Fruits the following people submitted grape vine samples: “The lady of the President of the Society” [wife of Colonel N. Townson] presented Catawba and Isabella grapes, Mrs Seaton presented a dishes of Isabella and Catawba grapes, Mr. George Shoemaker had “a noble display of Catawba grapes, Judge Morrell had “very fine black Malaga grapes, from a vine raised by himself from seed”, Georgetown College had a “handsome bunches of grapes”, Mr. Kurtz, Jr. presented “a neat frame containing bunches of Catawba grapes tastefully arranged”, along with grapes from Adam Lindsay which I have listed below. Clearly grape cultivation continued into the 1830s, whether wine was produced from these vines needs to be determined. 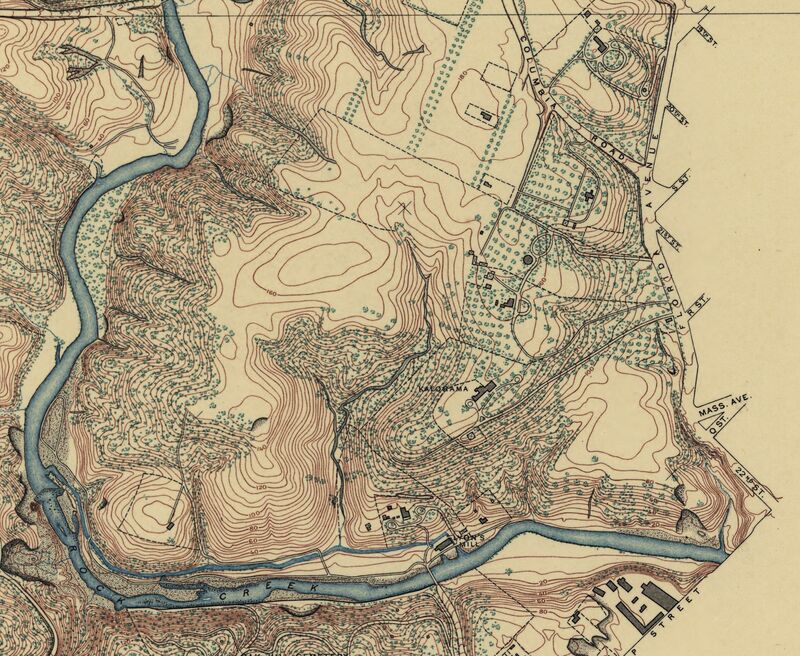 In the mid 18th century Anthony Holmead purchased large parcels of land near Georgetown and Rock Creek. In the 1790s he had his property resurveyed and subdivided including a 56 acre estate named Rock Hill. He also sold 30 acres and his first house to Gustavus Scott who renamed the property Belair. The property changed hands a few times until Joel Barlow purchased it in 1807 and renamed it Kalorama. Anthony Holmead had died in 1802 leaving property to his wife and children. His daughter Loveday married real estate broker Thomas W. Pairo in 1805. Together they acquired and lived at Rock Hill. Colonial George Bomford purchased Joel Barlow’s Kalorama estate in 1822. He acquired additional property increasing its size to 90 acres. By 1826, Colonel Bomford had also acquired the Cliffbourne estate. Washington, D.C. Ruins of Kalorama Hospital. 1865. No. LC-B817- 7690. Library of Congress Prints and Photographs Division. Colonel Bomford was the Chief of Ordnance for the United States Army during the War of 1812. He subsequently speculated in real estate. His Cliffbourne house was located on the western most part of the property which jutted out to the Rock Creek Valley. In 1826 he used the property as collateral to secure a loan from the Bank of the United States. 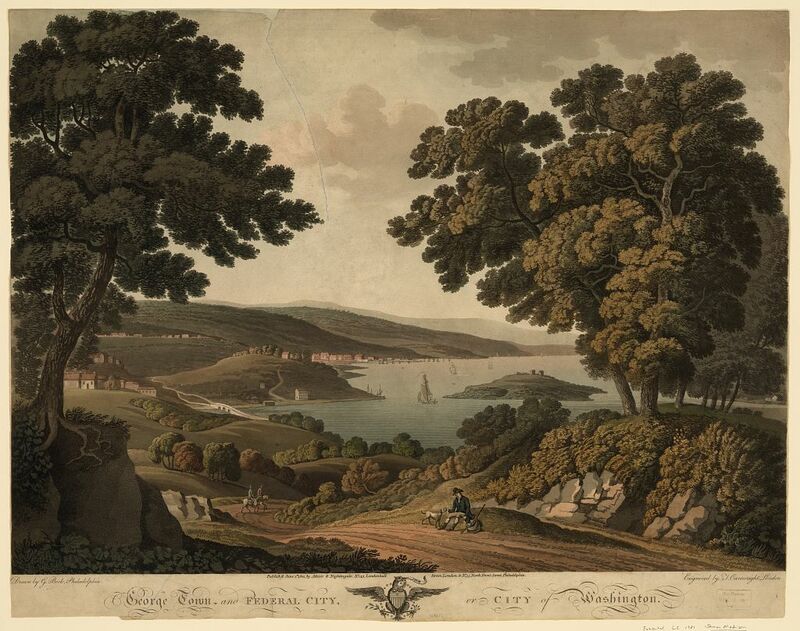 In 1830 Jonathan Elliot described Thomas W. Pairo as having “a fine thriving vineyard of the choicest vines.” Thomas W. Pairo’s estate was described as east of Kalorama “on this beautiful ridge.” On March 18, 1830 Thomas W. Pairo advertised “VINE HILL FOR SALE OR RENT”. The property was described as that of Colonel G. Bomford located one mile north of the President’s House and near Kalorama. It was of seven acres in size “well enclosed with 5 to 6 thousand Grape Vines mostly in a bearing state.” Applications could be made to Thomas W. Pairo at Rock Hill adjacent to Vine Hill. Mr. Smith in his 1816 Chorographical notes only one grape vine at Joel Barlow’s estate. Near the summer house “is a white walnut of about a foot in diameter, perforated by a grape vine of three inches in circumference, which has been squeezed to death by the growth of the tree.” General Henry Dearborn was noted in an 1846 report that “When I was in Congress…[o]n the plantation once the seat of Joel Barlow, a man of considerable reputation as a horticulturalist, the foreign vines had been dug up, and native substituted.”  General Henry Dearborn served as Minister Plenipotentiary to Portugal from May 7, 1822 to June 30, 1824. Upon being recalled at his request he returned to Massachusetts where he died on June 6, 1829. This implies grapevines were cultivated after 1816 and before 1822 or 1824. I have not come across any other references to Vine Hill. Crop from District of Columbia. Evans & Bartle, 1892. Digital ID g3850m gct00007. Library of Congress Geography and Map Division. 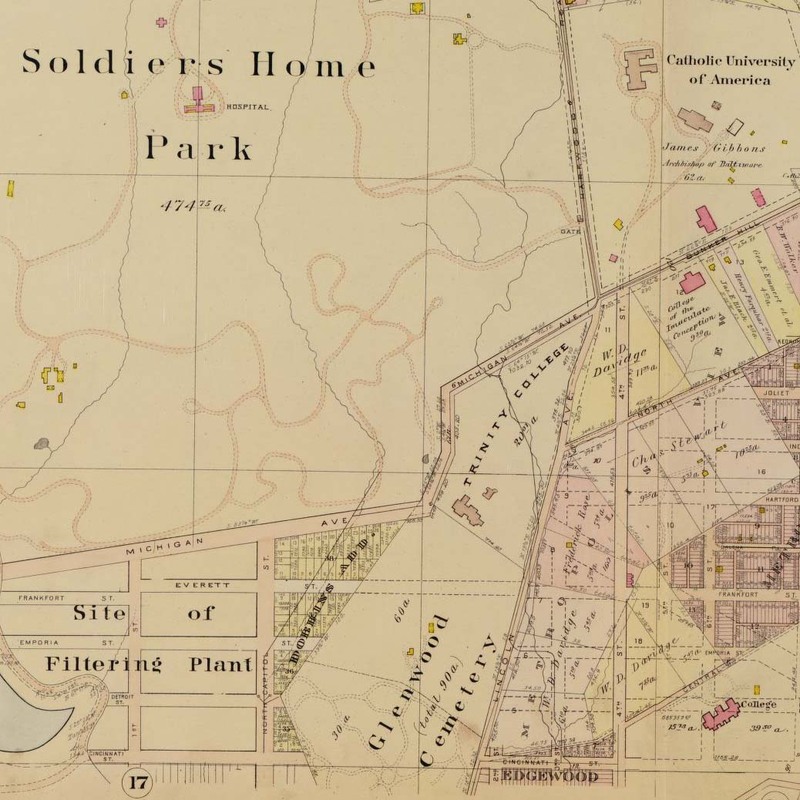 In looking at the 1892 cropped map, the Kalorama estate appears towards the bottom center of the map and was approached by a long driveway entered near Florida Avenue and R Street. Just north-east of Kalorama is a house with a circular drive in front of it. This is the Rock Hill estate. This map does not show any small seven acre property but it does help as a reference. Jonathan Elliot describes Thomas W. Pairo and Colonel Michael Nourse as possessing “snug little country seats” to the east of Kalorama. Crop from Topographical map of the District of Columbia. McClelland, Blanchard & Mohun, 1861. No. G3850 1861 .B6. Library of Congress Geography and Map Division. 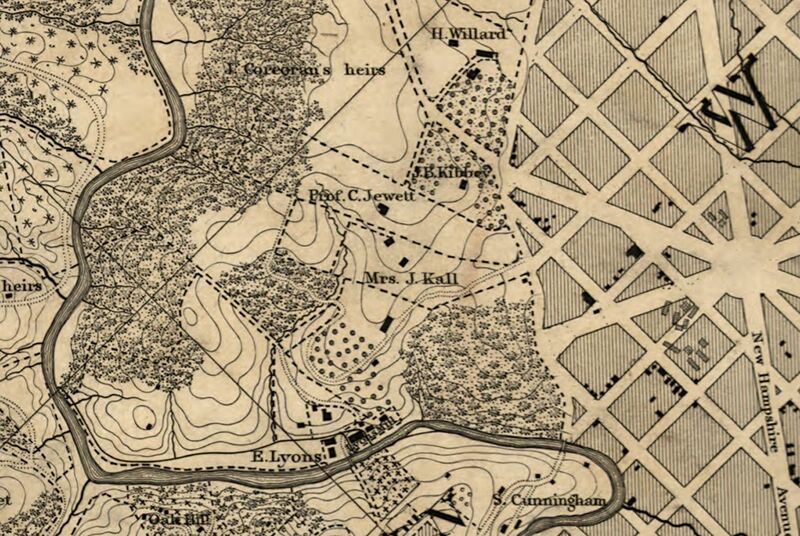 In the 1861 cropped map Kalorama is located just above “E. Lyons” and “Lyons Mill” which are located towards the bottom of the map just above Rock Creek. Just above the unlabeled Kalorama appear the properties of Mrs. J. Kall and Prof. C. Jewett. 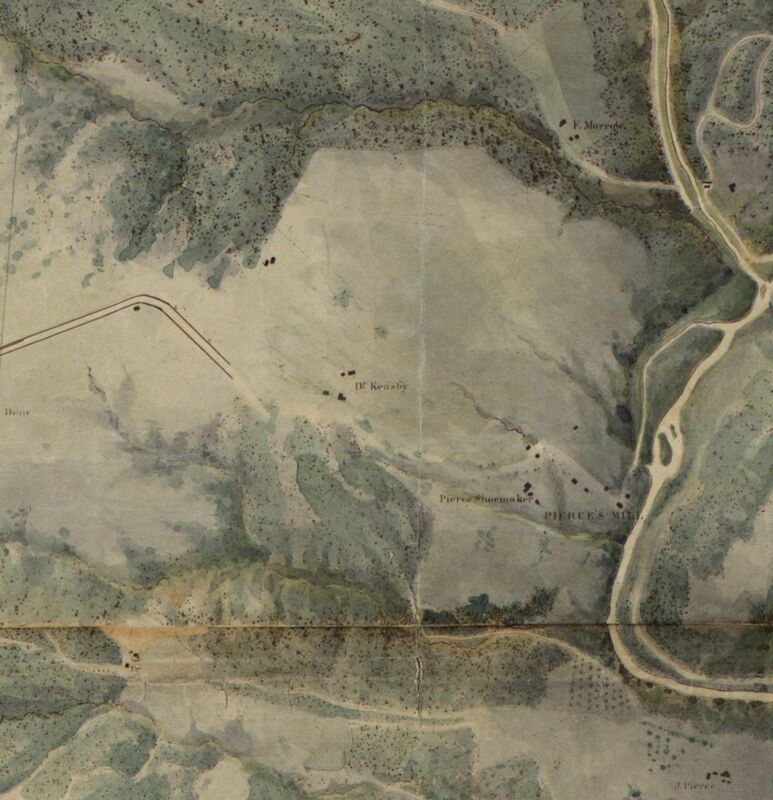 In comparing the 1861 and 1892 maps I believe that Prof. C. Jewett’s property is Rock Hill. That would make Mrs. J Kall’s property Vine Hill. However, Stephen A. Hansen notes in Kalorama Triangle that Thomas W. Pairo’s daughter Sophia Kall inherited Rock Hill. If the Kall property is in fact Rock Hill then perhaps the small square property to the northwest of it was Vine Hill. 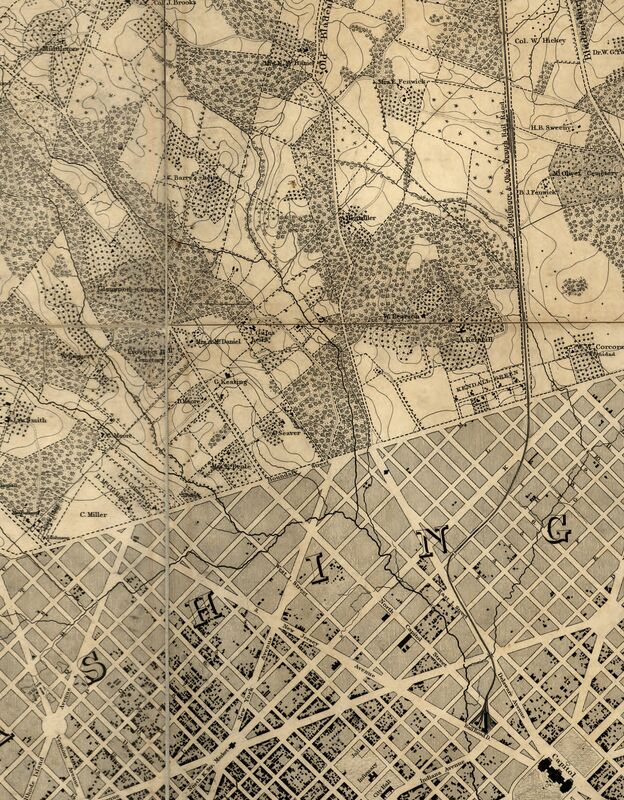 Crop from Plan of the city of Washington. Elliot, William. 1829. No. G3850 1829 .E4. Library of Congress Geography and Map Division. Adam Lindsay was an early resident of Washington, DC. On May 9, 1810 “AN ACT making appropriations to pay certain balances due by corporation” was passed by the City of Washington. In it the treasurer was authorized to pay Adam Lindsay, “a commissioner for building a reservoir near the Eastern Branch market house”, $90 for the balance due in building the reservoir. His name appears throughout the history of Washington, DC. For example, upon being alarmed at the construction of the Baltimore and Ohio Railroad he represented the Sixth Ward in a committee in 1827 to further the interesting of the Capitol City Canal. On August 21, 1833 The Columbian Horticultural Society was organized with Adam Lindsay as one of the officers. 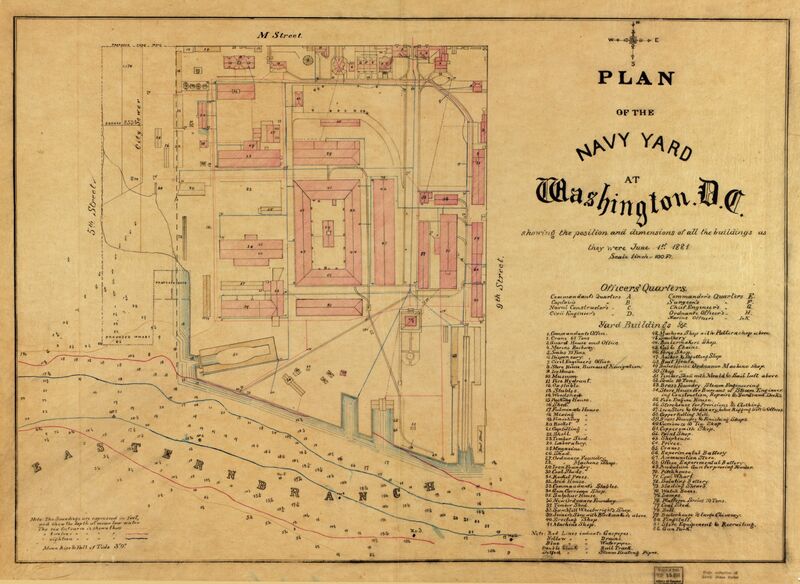 Plan of the Navy Yard at Washington, D.C. June 1, 1891. No. G3852.W352 1881 .P5.Library of Congress Geography and Map Division. City of Washington from beyond the Navy Yard. Bennett, W. J. 1833. No LOT 4386-A. Library of Congress Prints and Photographs Division. In the early 1800s the Department of the Navy “designed two small frame structures” to serve as the medical facility as the Navy Yard. Whether the vineyard was located next to the hospital within the Navy Yard or adjacent to the hospital outside the Navy Yard is unclear. In Bennett’s drawing I do not see a vineyard but there are are grassy areas within the Navy Yard and several small hills surrounding it. Perhaps the vineyard was located on one of these hills. Samuel Harrison Smith (1772-1845) was the son of Jonathan Bayard Smith, a member of the Continental Congress and signer of the Articles of Confederation. His early career involved writing and editing in Philadelphia before founding the first national newspaper The National Intelligencer. In 1813, he was appointed Commissioner of the Revenue for the United States Treasury, became Secretary of the Treasury in 1814, as well as serving as the president of the Bank of Washington then president of the Washington branch of the Bank of the United States. On September 29, 1800 he married his second cousin Margaret Bayard. She was the daughter of Colonel John Bubenheim Bayard and Margaret Hodge. Her father was a member of the Continental Congress and was later encamped with General George Washington at Valley Forge when she was born. She wrote several books including The Diversions of Sidney (1805), A Winter in Washington, or Memoirs of the Seymour Family (1824), and What is Gentility? (1825). In 1906 Gaillard Hunt edited a collection of her letters and notebooks in the book The First Forty Years of Washington Society. Her writings detail the close relationship with President Thomas Jefferson. Samuel Harrison Smith moved to Washington, DC when president-elect Thomas Jefferson suggested he create an official record of the new administration. Samuel Harrison Smith had a house in the city of Washington, DC. Shortly after marriage he purchased “Turkey Thicket” as a country seat. 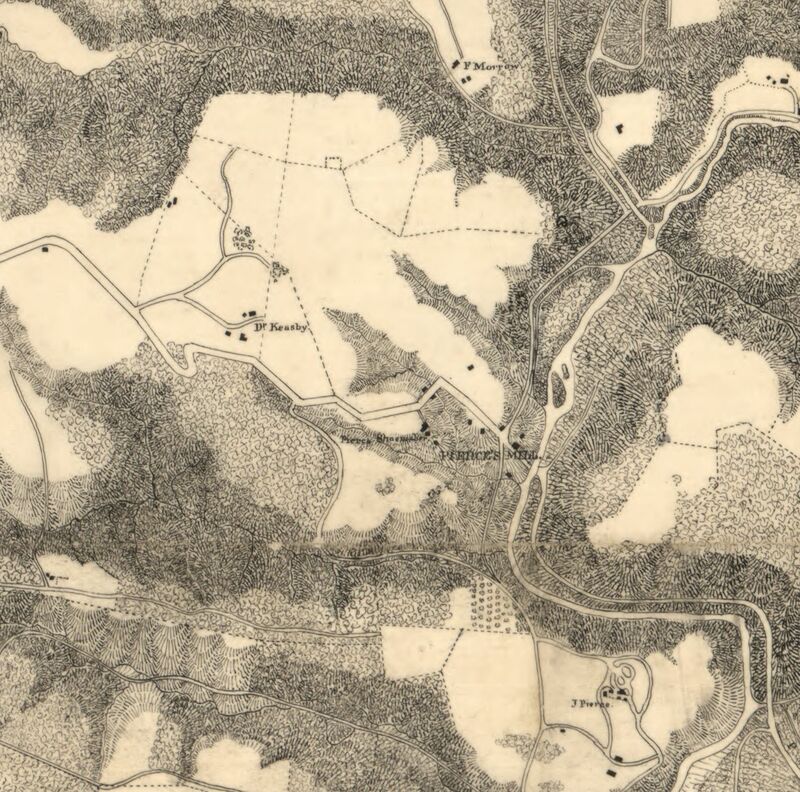 Turkey Thicket was originally granted and surveyed for John Magruder in September 1736 when it was located within Montgomery County, Maryland. It comprised some 160 acres of land. Samuel Harrison Smith acquired Turkey Thicket in 1804 paying $10 per acre. At the time it had been owned by Henry Duley, who had died intestate prior to 1802, thus leaving his ten children as heirs. Samuel Harrison Smith sold the land on January 1, 1839 to Mr. France after which it was purchased by the Middleton family in 1844 for $12,0000. 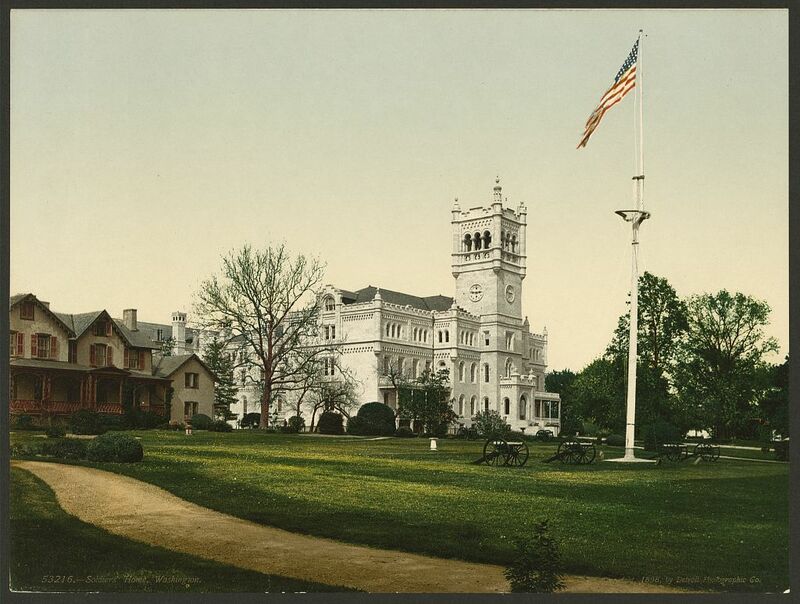 On October 27, 1886, land was purchased for Catholic University included the Middleton estate for $27,000. Unfortunately, Samuel Harrison Smith had never paid $74 for Eleanor Duley’s portion of the Turkey Thicket estate. It was not until June 26, 1889 that the title was cleared. Samuel Harrison Smith’s house was incorporated by the Middletons and the University into a yellow brick addition on three sides. It was eventually demolished in 1970. Mr. Smith in his 1816 Chorographical describes the “Residence of Harrison Smith, Esq.” He notes the “surrounding little hills, covered with trees, are truly romantic.” He lists some 23 “trees and shrubs” as growing on the property including “Wild Grape of different kinds.” Mr. Smith does not mention an orchard and gives the general impression that the land was undeveloped. 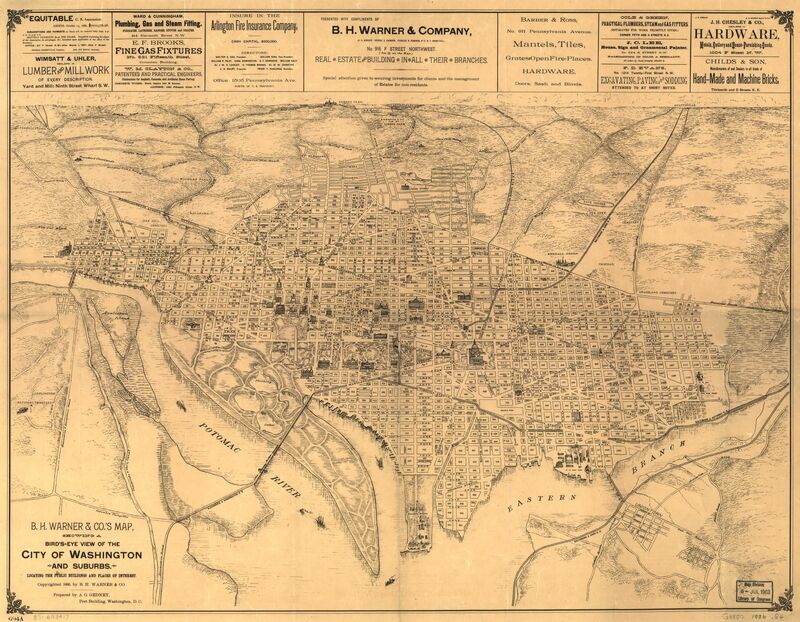 First Crop from Topographical map of the District of Columbia. McClelland, Blanchard & Mohun, 1861. No. G3850 1861 .B6. Library of Congress Geography and Map Division. I still have not found any other descriptions of the grape vines of the Sidney estate. The early maps of the Library of Congress show detail within the city of Washington but outside lie only creeks, rivers, and major roads. 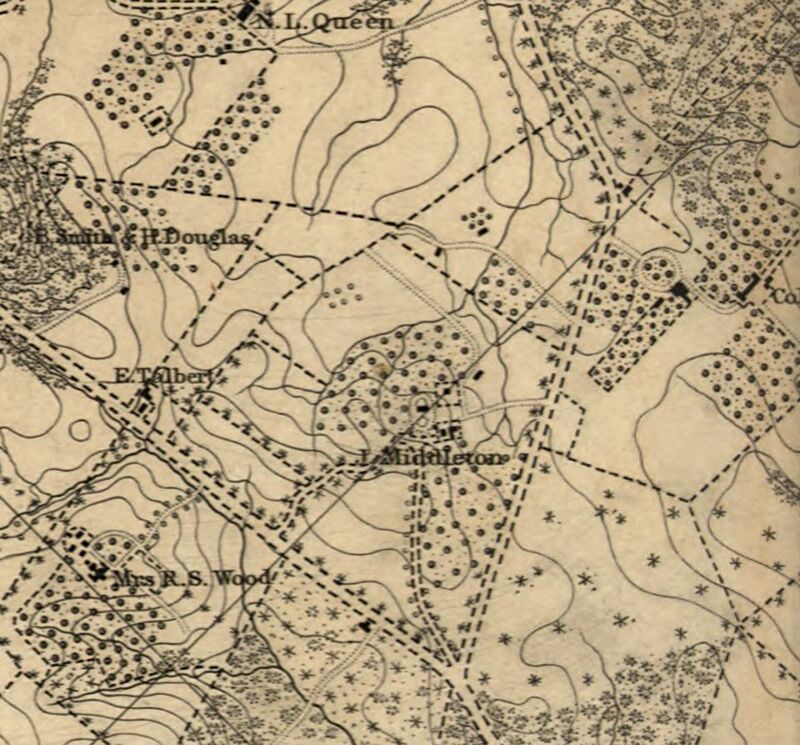 The Middleton estate is labeled in the Topographical Map of the District of Columbia published by McClelland, Blanchard & Mohun in 1861 as surveyed in 1856-1859. In the cropped map the United Sates Capitol would be located in the bottom right-hand corner and the Middleton estate in the top left-hand corner. This is actually north of the Capitol but due to the orientation of the map it is diagonal. Second Crop from Topographical map of the District of Columbia. McClelland, Blanchard & Mohun, 1861. No. G3850 1861 .B6. Library of Congress Geography and Map Division. The second cropped map reveals the Middleton estate in the center. At the bottom, middle of the map the road splits with the long tree-line driveway branching off from the middle of the split. 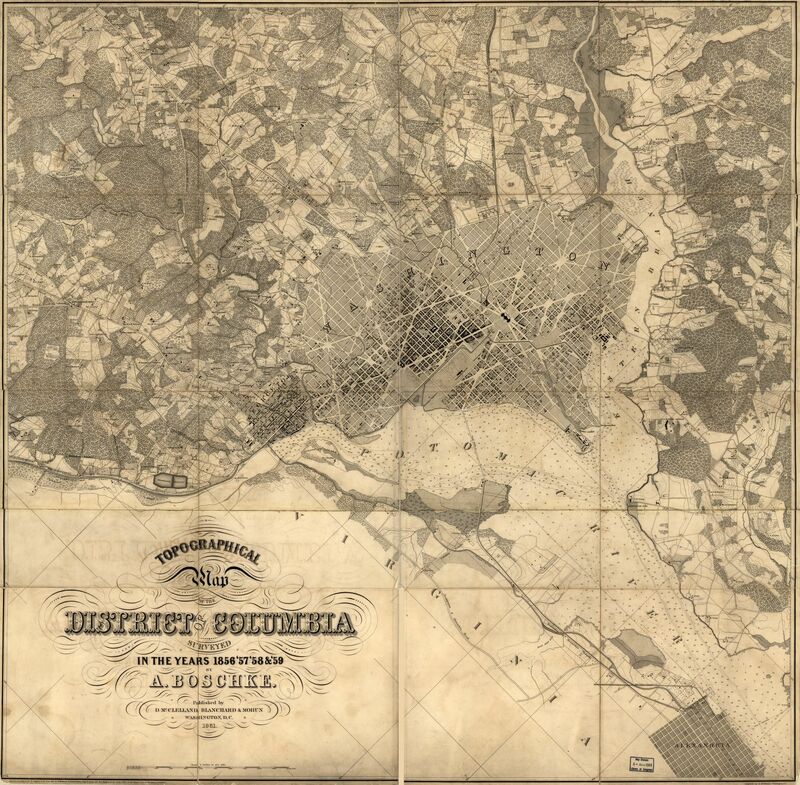 The third cropped map is from the District of Columbia engraved by Evans & Bartle 1892 – 1894. The estate layout remains the same despite the surrounding development of thirty years. It appears that mature trees are large green shapes with shrubbery or young trees as small green shapes. Both estate maps show forests, representing by random trees intermixed with shrubbery, and orchards and avenues represented by neatly spaced trees. In the 1861 map the house is surrounded by trees on the northwestern and southwestern quadrants. These trees are represented by neat roads with little dots in between them. 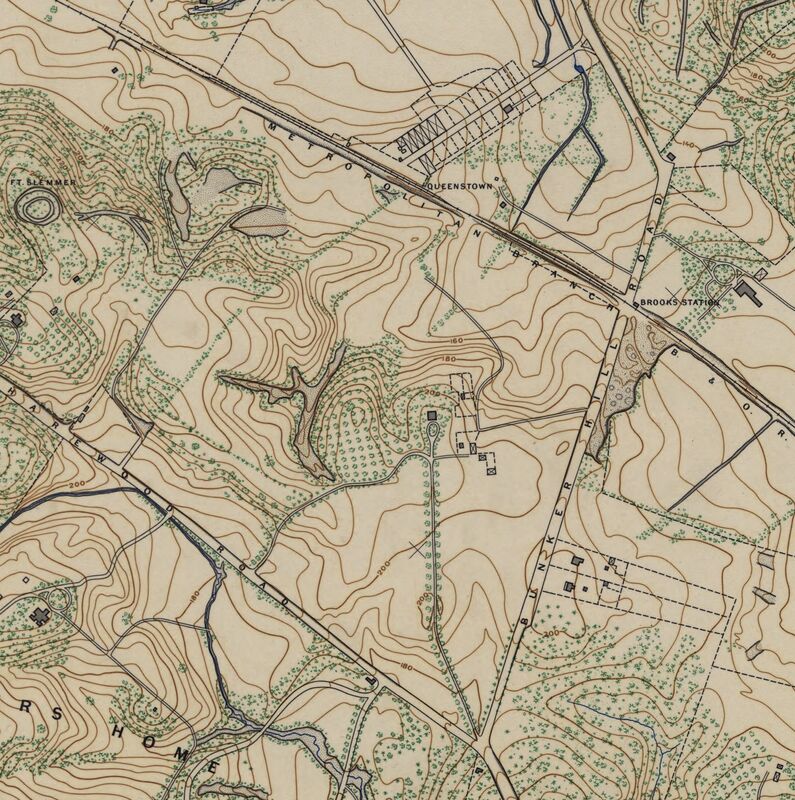 In the 1892 map the trees in the southwest quadrant have been removed. There are no little dots between the northwest quadrant trees but there are little dots, what appear to be shrubbery, surrounding the northern half of the house. The orchard and vineyard were reached from the house by gradually descending down then ascending up. The fruit trees and vines were in full view of the house. The topographic scales vary between the two maps but that of the 1892 appear every five feet, thus offering better detail of the terrain. It appears that if one left the house facing due west you would descend from just over 205 feet to 185 to 190 feet in elevation. Continuing west would require a steep ascent to a small peak of 215 feet which would offer a direct view of the house. The 1861 map also reveals neatly spaced trees and small dots in the southeastern quadrant. Jonathan Elliot only described one location for the vineyard and orchard. Jonathan Elliot published his book in 1830 and Samuel Harrison Smith sold the estate in 1839, so it is possible he expanded both the orchard and vineyard. In sticking to the northwest quadrant the 1861 map reveals approximately five long rows and two short rows of trees oriented on the diagonal. The trees approximately lie on a grid revealing some 36 trees. The rows of trees were planted 30 feet apart. With in a row of vines, they were planted six feet apart. This large spacing was to avoid shade. If the trees were planted on a grid then with a row the trees were spaced 30 feet. The five long rows contain six trees each thus was 150 feet in length. 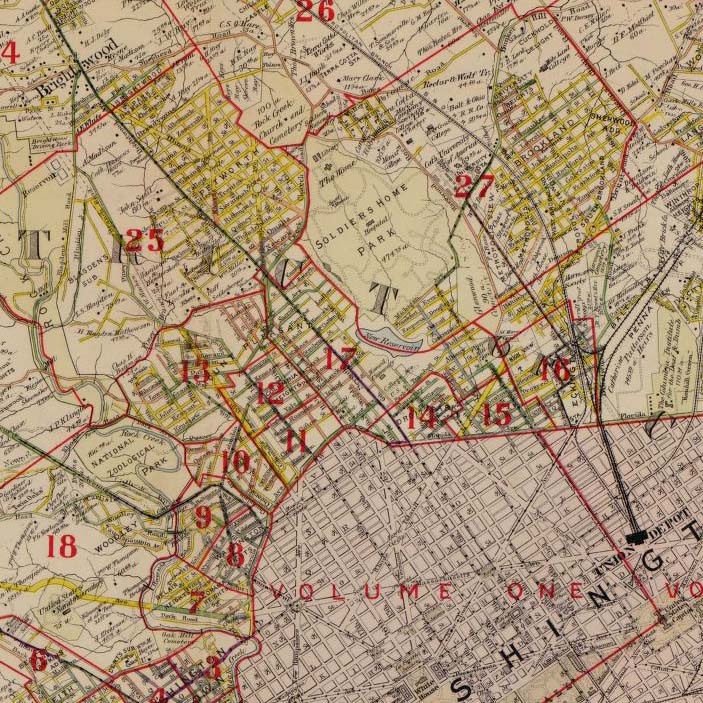 The 1892 maps reveal some eight rows of trees, oriented closer to the vertical, lying on a grid. There are approximately 90 trees in rows from three to 13 trees in length. The longest row would then be 360 feet in length. There is a discrepancy because the grid of trees represents the area of cultivation and not the actual number of trees. Using the scale from both maps I get approximately 525-600 feet as the longest row of trees. If we take the cultivated area to be a rectangle of 300 feet wide by 525 feet long then there would be approximately 17 rows of vines, each with approximately 88 vines. This yields almost 1,500 vines. Jonathan Elliot submitted Historical Sketches to the Clerk of the District Court for the District of Columbia on March 23, 1830. From Samuel Harrison Smith’s vines “Some experiments, of rather favorable issues, have been tried in making wine; but the vines are yet too young to expect much success in this respect.” Given the submission date of Historical Sketches the latest vintage Jonathan Elliot could have written about would be 1829. If the “experiments” consisted of a single vintage and he waited for the third year to produce the wine then the “young” vines could have been planted in the spring of 1826. Thomas Jefferson was a close friend of Margaret and Samuel Harrison Smith. He even visited the Sidney estate. While he might have encouraged Samuel Harrison Smith to plant a vineyard, he was never able to taste the wine.